The ancient and the contemporary in a luxurious and charming combination. It’s in Oporto's historical centre that we find the Hotel Infante Sagres, near the area classified as World Heritage, the arts neighbourhood and fashionable bars. 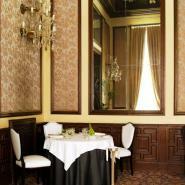 It's installed in a 50's building, with Neo-Baroque inspired interiors and contemporary style details. This is a unique hotel with sophisticated design and a luxurious atmosphere that throughout the years has conquered famous guests. The Norwegian Kings, the Queen of Holland, the Dalai Lama, Catherine Deneuve and John Malkovich have already approved the charm of its personalized service and intimacy of a private home. The rooms and suites sport a combination of original antiquities, with a modern art collection and exclusive furniture, which all result in an classical European environment and a stay full of comfort. The restaurant proposal goes to Book, a space that was the Aviz bookshop for decades and that now is renovated. It is unusual, original and faithful to its literary memories, present in decoration details, on the plates and cocktails. The delicious flavours are inspired by Portuguese traditional cuisine and contemporary innovation as well. You will also have at your disposal the treatments and massages of a small SPA, inspired by a temple situated in the ruins of Angkor in Cambodia, and which presents the ideal excuse to evade the city, regenerate your energies and obtain even more moments of pleasure in your stay at the Hotel Infante Sagres. From Lisbon to Oporto take highway A1. Head in the direction Porto / Arrábida / Gaia and take the exit Campo Alegre. Arriving to Oporto, follow through Via Panorâmica. After that, take a right in Rua do Campo Alegre and then a left in Praça da Galiza. Turn again in Rua de Júlio Dinis and follow through Rua de Dom Manuel II. Go straight ahead through Rua D'Alberto Aires de Gouveia and take a left in Rua da Restauração. After that, take a rigth in Campo dos Mártires da Pátria. Follow through Rua de São Filipe de Nery and take a right when reaching Rua das Carmelitas. Turn left in Rua do Conde de Vizela, following through Rua de Aviz. You will find the Hotel when arriving to Praça Dona Filipa de Lencastre.